1,2-Oxy-aminoarenes are omnipresent in biologically active molecules and advanced materials, but current syntheses are often atom and step inefficient, and can require highly optimized and expensive catalysts. 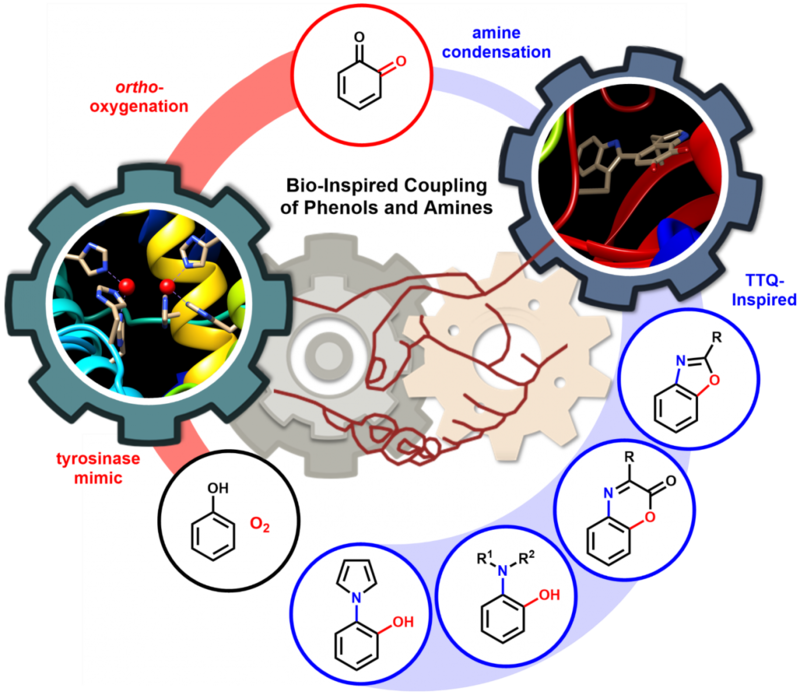 Recent work, conducted by graduate student Kenn Esguerra and postdoc Wenbo Xu in the Lumb Group, has made important strides towards improving the efficiency of 1,2-oxy-amioarene synthesis by interfacing two unrelated, but complementary, biosynthetic processes. The first is the biosynthetic production of pigments, known as melanogenesis, and the second is the bio-synthesis of collagen fibers. By combining aspects of these processes into a 1-pot, chemical process, the team has enabled a mild and efficient means of creating 1,2-oxy-aminoarenes at room temperature that creates H2O as the only byproduct. For more, see their recent articles in Chem and ACS Catalysis. The team also applied this strategy to the synthesis of valuable o-azophenols by coupling phenols and hydrazines or hydrazides (see their article in Chemistry – A European Journal). A highlight and a perspective of this work was also published in Chem.